MossWallArt Pieces for sale online - Best Living Artwork for Home - Best handcrafted 100% real MossWallArt pieces made with mosses, lichens, natural wood and organic features, living and natural moss artwork for your home. Our MossWallArt pieces are made with 100% real mosses, lichens, natural woods and organic features, each piece is a handcrafted, original work of art. 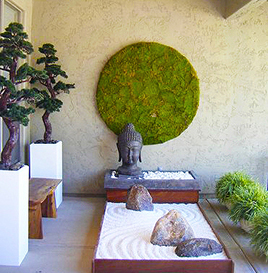 We create our moss sculpture pieces in standard, and custom sizes with the framing of your choice. If you are interested in custom sizes or pieces, please email info@plantsolutions.com for more information. MossWallArt is created exclusively for you. Of all the colors in the spectrum, green offers the widest array of choices. In every area of design and in a multitude of color combinations, green can be used much the same as a neutral color to enhance your décor in a distinctive way. Our gallery of work is diverse and encompasses a wide range of styles – please let us know which pieces you like so we can help you achieve your interior goals. Living MossWallArt creates dramatic spaces and sets a new bar for the extraordinary. They are mimics of the natural beauty that surrounds us, bringing the outdoors inside, preserving a gorgeous moment in nature. There are infinite design possibilities and different shades can be combined to create random patterns. They draw you in visually, absorb sound, speak to our innate Biophilic need and are a calming element of nature. 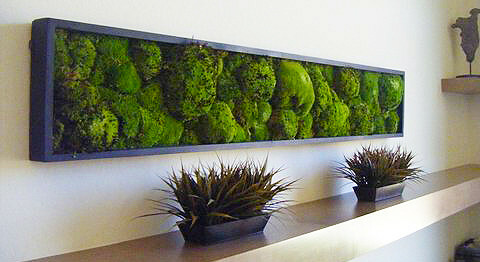 MossWallArt enriches any space and is the perfect addition for any decor. Our unique pieces are intended for use indoors, but can be displayed outdoors in a protected area such as a patio. Use of living and harvested natural elements offer a simple solution to creating a hanging, living garden. Showroom hours by appointment. Prices start at $295. 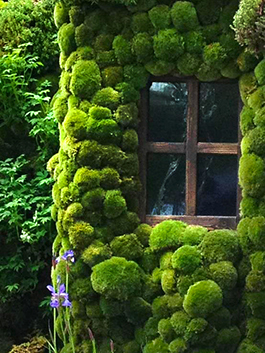 MossWallArt was created by Plant Solutions, a leading living wall design firm. 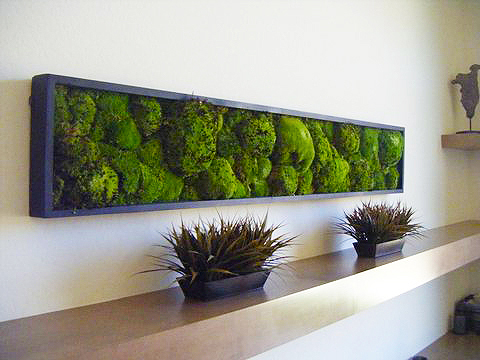 While working as living wall designers, demand for our moss wall art kept increasing. Our clients asked for maintenance free options to our popular live installations. We found that we could create dimensional art pieces to compliment interior designs at any scale. We pride ourselves on painstakingly designing and creating contextual works specific to each client. We are the leader in the new and exciting market of moss wall art, we have refined and evolved the creation process assuring long term installation success. Don’t be fooled by cheap imitations, there is no substitute for the quality and sustainability of our pieces. We stand behind every one we create. We commit to being at the forefront of new and exciting developments in the living wall art world. Whichever style you desire, residential or commercial, our MossWallArt can successfully fulfill your vision. Our emphasis is on quality and personalized service. Attention to all the details has added up to successful projects and satisfied clients. Joe Zazzera and Pat Mahan are the owners of Plant Solutions. Together, along with Hawaiian designer Brad Heinicke, they have masterminded an exciting new creation and trend in interior living designs. After 34 years in the interior plantscape and design business, they have developed custom vertical moss wall designs that are at the forefront of all moss wall art. 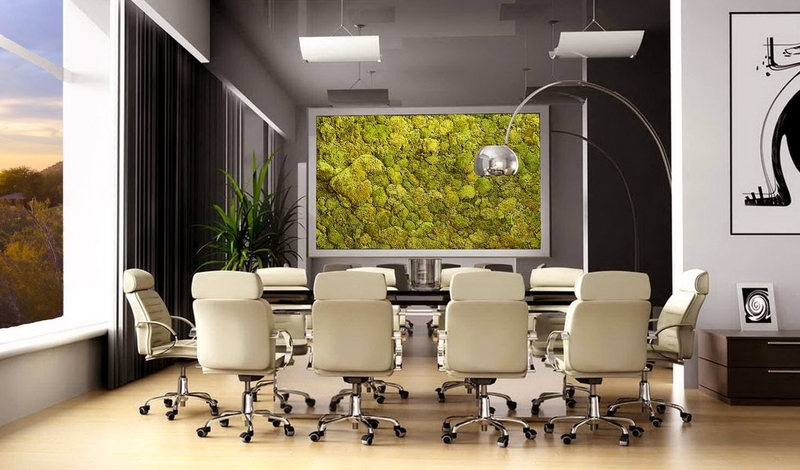 The entrepreneurs are known for custom designing each moss art piece to fit the client’s desires as well as making the space it will reside feel unique. Check us out at "INHABITAT"
MossWallArt™ by Plant Solutions is featured as a leading edge innovation in biophilic design.